On Monday 23 June, Dr Gabrielle Appleby, Dr Laura Grenfell and Ms Adele Lausberg from the University of Adelaide’s Public Law and Policy Research Unit presented at the Gilbert and Tobin Centre of Public Law’s Workshop on Party Discipline and Parliamentary Process. The abstracts of their papers are below. Australia was once a world leader in parliamentary oversight of delegated legislation. Today, parliamentary scrutiny has been undermined by a number of factors, including overly wide delegations, uncritical bi-partisan support for measures, party discipline restraining oversight, abuse of the disallowance procedure and parliamentary recesses to avoid parliamentary scrutiny, and interest-group capture within government. One of the reasons for the current state of affairs has been the constitutional orthodoxy in Australia that the courts do not intervene in the relationship between Parliament and the Executive. This paper develops an alternative to that orthodoxy. I argue that the courts have a proper and necessary role in prodding parliamentary oversight of executive power, specifically in the delegated legislative sphere. There is a wide spectrum of political rights review in Australia, stretching from the Commonwealth’s Parliamentary Joint Committee on Human Rights (PJCHR) at one end with its very broad mandate, to a group of three jurisdictions which have no parliamentary committee mandated to conduct human rights legislative scrutiny or even general scrutiny of primary legislation, namely South Australia, Tasmania and the Northern Territory. Just before the latter end of the entire spectrum sits Western Australia which has no parliamentary committee that performs rights scrutiny: the WA Legislation Committee can conduct general scrutiny of primary legislation but only when authorised by the WA Upper House. While its formal terms of reference do not include rights scrutiny, such scrutiny is taking place through informal means, making this an interesting committee to study. Closest to the PJCHR on the spectrum are the parliamentary committees operating in both Victoria and the ACT which have received much scholarly attention. The mandate of these committees is much narrower than that of the PJCHR, covering far fewer rights provisions. Unlike the PJCHR, they only perform pre-enactment legislative scrutiny, leaving post-legislative scrutiny to other institutions. Positioned in the middle of the spectrum are NSW and Queensland. 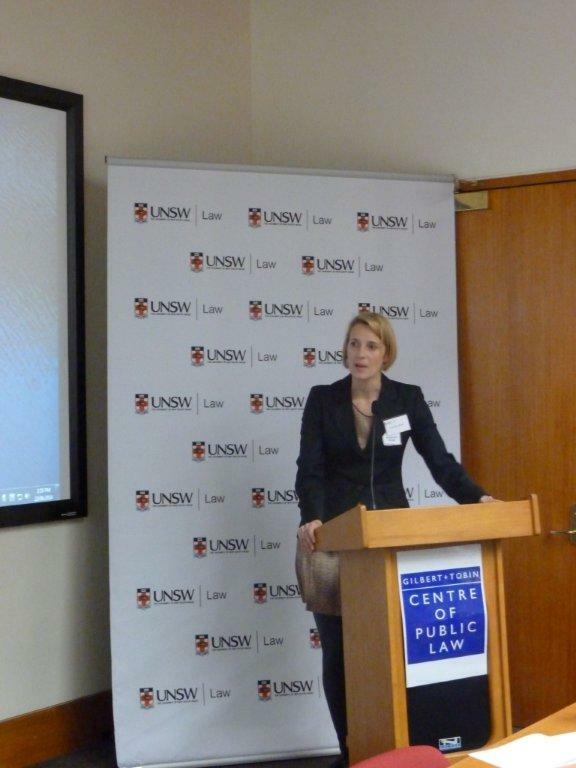 The mandate of NSW’s Legislative Review Committee includes the scrutiny of rights, some of which include human rights, but in practice it has focussed predominantly on civil rights and liberties. Since the recent change of government, this committee has shifted to a lower gear. Queensland has a more decentralised approach in that all parliamentary committees are required to scrutinise legislation against a set of legislative standards which include some human rights. While this is innovative, this means that Queensland has no parliamentary committee specifically dedicated to scrutinising legislation for human rights compatibility. Furthermore, these committees operate in a unicameral system. This paper aims to present the spectrum of political rights review mechanisms in Australia in order to ascertain whether it is possible to identify any standards of such political review operating in Australia. 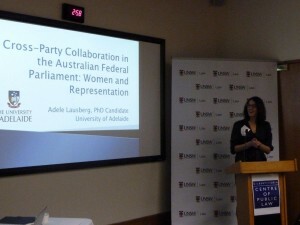 The Australian Federal Parliament has been host to a rare but fascinating phenomenon of ‘cross-party collaboration’ (CPC), in which politicians work together across party lines by co- sponsoring a bill or voting together in a conscience vote. CPC points to gaps in political parties’ platforms, leading individual politicians to seek representation of certain issues outside party divisions. In this paper I will explore the phenomenon of CPC and outline different ways it has been used by politicians. As I will demonstrate, CPC in the Australian context is relatively gendered as mainly women politicians have used it to advance socio- moral issues. This entry was posted in Government & Citizenship, Research and tagged cross-party collaboration, parliamentary joint committee on human rights, Parliamentary Process, Party Discipline, Public Law and Policy Research Unit (PLPRU). Bookmark the permalink.